The slashing Japanese attack in the western and central Pacific in December 1941 opened the prospect of a more active military role for Alaska, especially if the Soviet Union became involved in the new Pacific war. Even before the Japanese struck, the United States had been hoping to obtain the use of Soviet air bases in the Vladivostok area, and, if Japan now attacked the maritime provinces of Siberia, the military collaboration of American and Soviet forces in the North Pacific appeared inevitable. At the outbreak of war the Army garrison in Alaska numbered about 21,500 officers and enlisted men. During the next five months this total nearly doubled, to a strength of 40,424 by the end of April 1942, considerably more than had been planned in the first wartime troop basis for the Alaska Defense Command.9 A considerable proportion of this total was accounted for by engineer troops needed to rush construction work at the new Alaskan air bases. Getting combat planes to these bases was a more difficult matter. The Aleutian Islands extend in a long, sweeping curve for more than a thousand miles westward from the tip of the Alaska Peninsula. All of the islands are mountainous with no trees and little level ground suitable for the construction of airfields. From the shore line jagged peaks rise abruptly to an elevation of several thousand feet. The empty trough-shaped valleys are covered by tundra, a spongy mat of dead grass, on top of a layer of volcanic ash which when wet quickly churns into mud. Aleutian weather is notorious. Although the islands are not excessively cold, since they lie well below the Arctic Circle, rain, snow, and mist are the rule rather than the exception. These bare and almost unpopulated islands are also battered by violent winds and are hidden for much of the time in swirling fog. On the globe the Aleutian chain appears to provide a natural route of approach toward either the continental United States or Japan. But the forbidding weather and wretched terrain made this seemingly natural route all but impracticable in 1942. Nevertheless, neither the United States nor Japan could afford to assume that the other would reject it as impracticable. From the beginning of hostilities the War Department had recognized the vulnerability of the new bases in southern Alaska and particularly of the exposed installations in the Dutch Harbor area. Temporarily, Japan's uninterrupted drive into southwestern Pacific and Indian Ocean areas eased concern over Alaska, but it soon revived. In mid-March G-2 warned that a Japanese attempt to seize the Aleutians or raid the mainland of Alaska in order to prevent the United States from using the northern approach to Japan and to obstruct communication between the United States and the Soviet Union could be expected at any time.19 After the Doolittle raid on Tokyo in April, it was generally expected in Washington that the Japanese would retaliate by raiding the west coast or Alaska. The Army and Navy took quick steps to counter the anticipated Japanese blow. 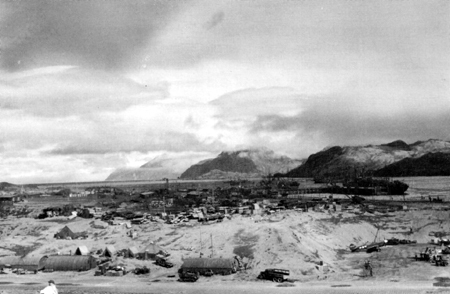 As a precaution the War Department directed that the Umnak field and other facilities in danger of capture be prepared for demolition, but in transmitting this order General DeWitt assured General Buckner that additional means for defending Fort Glenn would be provided.23 The Navy prepared to reinforce its existing minuscule "Alaskan Navy" by establishing a new Task Force 8, under the command of Rear Adm. Robert A. Theobald, and assembling its principal components (five cruisers, fourteen destroyers, six submarines, and auxiliaries) off Kodiak as rapidly as possible.24 On 21 May General Marshall and Admiral King declared a state of fleet-opposed invasion prospectively in effect "until and if invasion in force of Kodiak or Continental Alaska become imminent." At the same time they directed that all Army and Navy air units then in Alaska should be put into a task force to be commanded by the Army's General Butler, who in turn would report to the new Task Force 8 commander on his arrival in Alaska. Army ground forces were kept under Army command, and General Buckner was to co­ordinate their employment with those of naval forces by mutual co-operation.25 When Admiral Theobald reached Kodiak on 27 May, he and General Buckner agreed to maintain these command relationships unless the. Japanese captured a base in the Umnak-Dutch Harbor-Cold Bay area, in which event an invasion of the mainland might be deemed imminent and unity of command over land and shore-based defense forces might therefore be vested in the Army.26 These preparations and command arrangements reflected a widespread belief among American planners and commanders that the Japanese were bent on capturing Dutch Harbor. After recovering its planes, the enemy task force moved off in a southwesterly direction. During the night Admiral Kakuta changed course for Adak, which he had been ordered to soften up. But the weather was so bad that Kakuta decided to cancel the Adak attack and return for a second assault on Dutch Harbor. Late on 4 June Japanese planes struck again and destroyed four oil storage tanks, demolished a wing of the naval hospital, and partially destroyed the beached barracks ship Northwestern. Army and Navy casualties at Dutch Harbor for the two days were forty-three killed (thirty-three of them Army) and about fifty wounded. Both Dutch Harbor attacks were opposed by intense antiaircraft fire from land artillery supported by the naval guns fired from ships in the harbor. And, however startling they were, the attacks had little effect on the use of Dutch Harbor as a forward naval base. While Army planes based on Umnak and at Cold Bay were not able to prevent the enemy from bombing and strafing Dutch Harbor, planes from Umnak did intercept 8 of the Junyo planes returning from the second day's attack and shot down 4 of them while losing 2 of their own. Army and Navy efforts on 3 June to locate and attack the enemy carrier force were fruitless. The next morning a Navy patrol plane spotted the enemy, and several flights of Army planes attacked during the day. In the early afternoon a medium bomber dropped a torpedo on or beside one of the carriers, but it failed to explode. Six heavy bombers were flown forward from Kodiak on 4 June, and 2 of them succeeded in locating and bombing the enemy force. Before the day was over, other medium bombers from Umnak fired two torpedoes at an enemy cruiser. Contemporary claims by flight crews of explosions and hits were all denied by the Japanese after the war, and apparently the enemy surface ships escaped unscathed. During the whole action the Japanese lost about 10 planes, the Army 5 (and at least fifteen airmen), and 6 Navy patrol planes were put out of action. Until these transfers had been effected, command relationships were an important factor in reopening for discussion two proposals argued during 1941. The one was whether the commanding general in Alaska ought to be an air officer. The other was the closely related question of whether the Alaska Defense Command ought to be detached from the Western Defense Command and established as a separate theater of operations. professed reason for the change was that Army planners had "always had in mind that after the ground forces were well established in the Aleutians the command should pass to an air man as that would be the principal arm of operation." 42 It is far more likely that the real reason General Marshall proposed to make the change in command was to permit a quiet shift in personnel that would eliminate one basic cause of friction between the services. At any rate, after the Alaskan naval commander had been replaced, and after a close and harmonious working relationship developed between his successor and the commanding general of the Alaska Defense Command, the matter was not pressed. Once again General DeWitt argued vigorously against the proposal to separate Alaska from the Western Defense Command, reviewing in detail the reasons he had given in the spring of 1941. He maintained that the Alaska and Western Defense Commands were strategically interlocked by a single mission. He also argued that supply and administrative matters could be more effectively administered by a single command than otherwise. Washington staff planners, on the contrary, favored an independent Alaskan command. They felt that from the strategic point of view there was no more reason for Alaska to remain under the Western Defense Command than for Hawaii to be in the same subordinate relationship. They argued that because of the improvement in supply procedures and communication facilities a separate Alaskan theater was entirely feasible. They believed that the size of Army forces in Alaska and the possibility of major operations in the area justified the establishment of a separate command.43 For the time being nothing was done to alter the chain of command, although the matter remained a subject of staff study throughout the winter of 1942 and for most of 1943. Following this exchange the United States sent Maj. Gen. Follett Bradley to Moscow for staff conversations, and the Army Air Forces began to prepare Ladd Field at Fairbanks (rather than Nome) as the delivery point for lend-lease planes destined to the Soviet Union.47 When General Bradley reached Moscow at the end of July, he found Russian officials primarily interested in the ferrying project. They professed no alarm over a Japanese threat to Siberia and were evidently as determined as ever to avoid a two-front war as long as they were hard-pressed by the Germans in Europe. CONSTRUCTION ON ADAK. Airport and harbor (top). 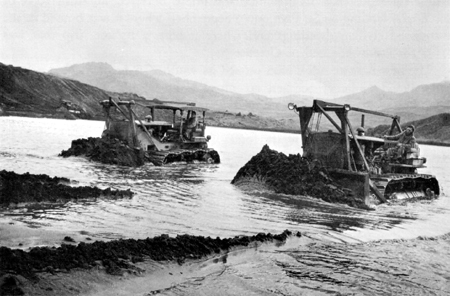 Dredging sand from an inlet to fill in the airfield (bottom). As soon as the airfield on Adak was in operation, General Buckner and Admiral Theobald began preparations for the occupation of Tanaga, which they planned to do by the end of October.56 As originally conceived, this was to be a defensive measure intended to thwart a Japanese move in the direction of Adak. For the purpose of supporting an assault on Kiska, Tanaga offered no particular advantage over Adak. The stage was now set for the next phase of operations, amphibious attacks to eject the Japanese from their Aleutian footholds.